Its only few days since Apple has announced it new iOS, but we are getting news that iOS 8 will be jail-breakable. It seems like nothing has changed in beta of iOS 8 kernel, and no new patches were introduced by Apple. With this, we can expect a jailbreak of iOS 8 sooner than expected. But, if the jail-breakers community release the tool sooner, its highly probable that Apple will fix the hole in its next version. Also, its a known fact that a jailbreak tool for iOS 7.1.1 is not publicly available yet. We have to wait to see more! 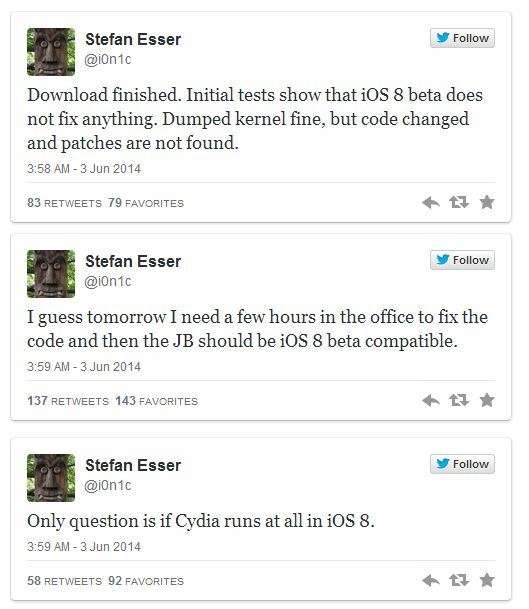 Below are tweets about iOS jailbreak from a well known hacker i0n1c.